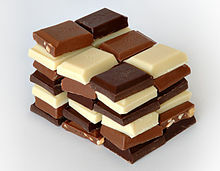 Confections, also known as sweets, lollies, and candy, refers to any sweet, sugar-rich dish or food item. Confectionery items include sweets, lollipops, candy bars, chocolate and other sweet items of snack food. Note: If you are going to list a recipe here, first check the dessert section to see if it would be better listed there. For a complete, automatically generated, list of recipes which have been categorized, on their individual pages, as being confection recipes, visit Confection recipes. This page was last edited on 16 December 2014, at 10:39.